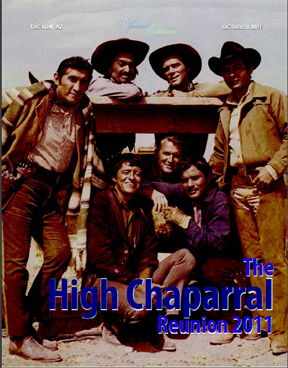 The deadline to place an order for The High Chaparral Reunion 2011 items has been extended for THREE DAYS ONLY. Get your order in now before it closes on Sunday, September 18th. The original deadline was 9/15, but there were so many last second shoppers we decided to give fans a few more days to shop. We're going to push the printers to make sure everything is delivered on time in Tucson, but if you're interested in something, place your order right now on the Reunion merchandise page. This year Chaparral memorabilia buffs and fans who can't attend the Reunion but want to participate can still have a keepsake while helping support the Reunion. Order by the September 15th deadline to be sure you aren't disappointed. A limited edition Reunion 2011 magazine is now available for order. A glossy, full color Program,the magazine has over thirty photos, articles, quotes from scripts, and the full schedule of events for the Reunion at the Ranch weekend. NOW WITH 20 PAGES FULL of photos and articles! The Reunion 2011 magazine is $20.00 USD, shipping included, and will be shipped in October when it's printed. There is a very limited print run so if you want a copy don't be disappointed, be sure to pre-order. "Been there, done that, got the T-shirt" . What would an event be without it's very own logo t-shirt to go with it? 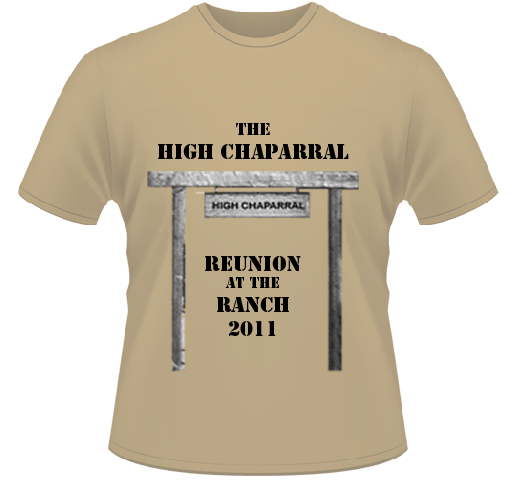 The High Chaparral Reunion 2011 is no different, so fans can purchase a Reunion at the Ranch 2011 logo shirt, available in sizes Small to 5XL. Order your Reunion T-shirt here. Shirts are $19 s-xl,( larger sizes extra) shipping included, and will ship in October when printed. 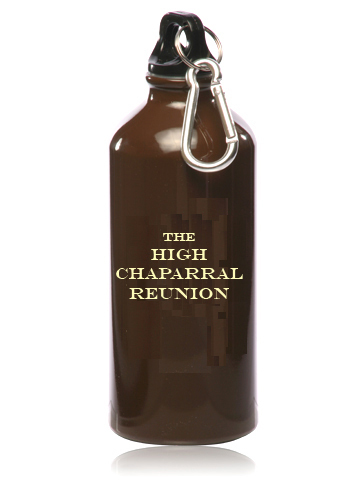 Everyone knows it's HOT in Arizona, so you need to keep water handy in your Reunion water bottle - that's why everyone who attends the Reunion will receive one! But if you can't attend you can still have one of your own - 20 oz. BPA free aluminum, twist cap with wide mouth, the customized bottle in chocolate brown comes with a carabineer – attach to a backpack for easy access. $6.00 including shipping, and like all Reunion keepsakes, only available by pre-order. We have 85 attending the Reunion at the Ranch in Old Tucson, October 21-23 - with more signing up almost every day. Fans, stars, cast members, local Tusconians who know this event can't be missed are all lined up to attend. This is truly a once in a lifetime event. Don't miss your chance to participate. We still have a few spots open but need your registration now to guarantee your spot. Go to www.thehighchaparralreunion.com to reserve your adventure at the Cannon Ranch house, and join us on The High Chaparral! The 2009 Reunion in Tucson was a dream fulfilled. Every time I watched an episode, I wished it was possible to actually visit the High Chaparral house. So, for me, one of the highlights was the day spent in Old Tucson. Seeing, touching and entering the actual Cannon ranch house was as much of a thrill as meeting Henry, Don, Rudy and Ted and all the friendly fans. I was determined to bring home a piece of the High Chaparral, so under the sizzling hot sun, went out behind the house and dug up a bit of honest-to-goodness Arizona desert dirt from under a bush and put it in a plastic baggie for safe keeping. 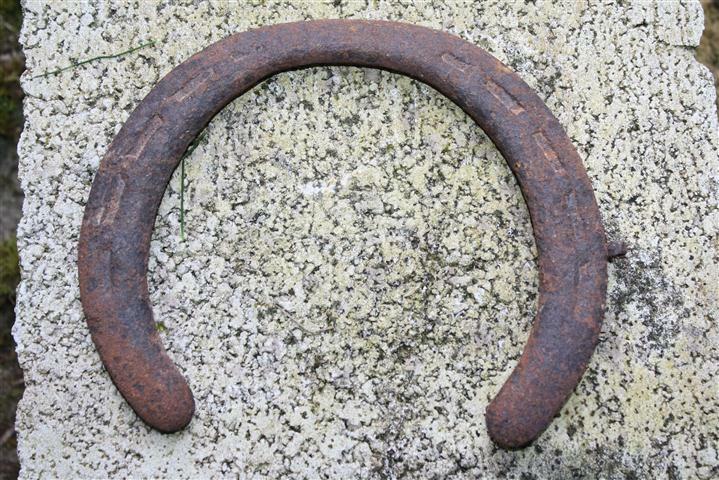 On my way to rejoin the crowd, something rusty poking up from the dirt caught my eye, and I unearthed a horseshoe! I couldn’t believe it! An actual Cannon ranch horseshoe! It was immediately obvious -- to me, at least -- that it had belonged to Mackadoo (Manolito's horse). (It’s most likely from a draft horse, but I’m happy with my little delusion.) I told Henry about it later that evening, and he agreed that it most definitely did belong to Mackadoo. “Yes, believe that!” he enthused. With all the security restrictions at airports these days, I had to be absolutely certain it wouldn’t be confiscated as a “weapon” and was prepared to ship it home, if necessary. When I contacted the TSA and explained my dilemma, the agent laughed and said it was okay to pack it in the carryon bag because it was unlikely that I could “horseshoe someone to death with it.” The Tucson airport security personnel got quite a kick out of my declared baggie of desert dirt and the rusty horseshoe. Mackadoo’s shoe -- one of my most prized reunion souvenirs -- now resides on the fireplace mantle. Next to it sits a little bottle containing a smidgeon of the real High Chaparral. With you all in Arizona, but that state does not have sea! 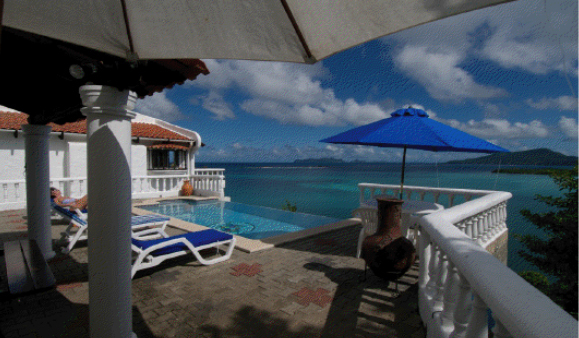 On a small Caribbean island that is just a few miles wide. I know without a doubt that I’ve seen every rerun! Since life cannot be easy in the profession you chose. I will save my warmest welcome for the cast of Chaparral! ‘I’m Mano!’ said David jumping up. ‘I’m Victoria!’ shouted the aptly named Crystal rushing for her beaded ‘Victoria’ drawstring bag. ‘If he did then he would need a different name and he wouldn’t be Mano,’ argued David, the first to claim exclusive right to the name. I recently visited my friend Jacinta and was met by this volley of HC names. It seems that her three children are big fans of the show. Well maybe ‘big’ doesn’t cover it. By the look of all the dress up bits and pieces they had, enormous might be a better word. ‘So they’re both going to be Mano?’ I asked. Thanks to being able to record HC, Jacinta waits until her husband comes home from work and every evening they watch it as a family. It all started as a way to get everyone together for one hour after it was discovered that the children, aged six, seven and eight, also loved the show. Given the mature content of the series, it is surprising but there you have it. The most coveted pieces of the children's High Chaparral prop collection. Crystal forbade the inclusion of Kenny's Darth Vader figurine. I soon learned why. Jacinta told me about the many times her children’s behavior was influenced by their favorite characters. Crystal refused to use bad language among her friends because Victoria would never do it. The boys were usually helpful because the people at the Cannon ranch helped their friends and neighbors. Best of all, when Kenny was reluctant to do his reading homework after the first few struggles with it, he pretended to be Big John, as he faced each new challenge. This got me thinking. As fans, we all want to keep this show alive by our involvement in the newsletter, forums and attending reunions in Tucson. But have we given much thought to the impact it might be having on young children seeing it in this world of violent, mindless and often offensive television viewing? I was learning about its impact on one family. It seemed that Crystal refused to watch a certain rude but popular cartoon because, ‘Victoria would consider it vulgar.’ When asked where she learned the word vulgar, Crystal informed her father that she had heard Victoria use it and asked her teacher what it meant. Crystal’s teacher said she’s got the best vocabulary in the class. The child takes note of any new word she hears on the show, learns its meaning then tries to incorporate it in her day to day speech. This little lady keeps her room tidy (usually! ), because Victoria is always tidying up the Chaparral. The boys willingly help their dad with the ‘men’s work’ because the men at the Chaparral work together. Once, when David left the back door open and their new kitten escaped, he tried passing the blame on others then stopped mid way and accepted his responsibility. Why? Because the day before they’d seen the episode called, ‘To Stand for Something More’ where Blue is left in charge of the ranch for the first time and, among other mistakes he makes, loses John’s prized stallion. Like Blue, David redeemed himself by recovering the kitten. She hadn’t gone far and was found safe. 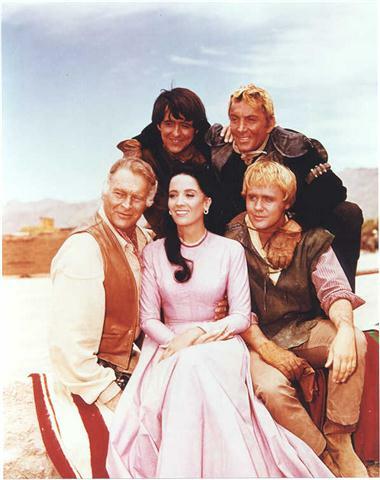 There was no question, High Chaparral was influencing a new generation in ways we wouldn’t imagine. Of course, they didn’t always behave like model children. As she suggested, Jacinta dreaded the days when they felt like being El Lobo! On one El Lobo day, they worked out a scheme to steal Victoria’s ‘jewels’ – a bag of jellybeans she had won at school. They were half way through digesting the precious objects when their sister appeared, catching them red handed. I could just imagine the delicate little girl chasing her brothers around in Spanish anger the way Victoria goes after her brother. Meanwhile, the boys continued squabbling about who would be Mano. It was time to go and as she saw me to the car, my friend looked thoughtful. Their faces lit up. ‘Okay. I get to be Matt!’ piped David. ‘I get to be Big John!’ said Kenny, for the first time, coming up with a response that didn’t clash with his brother. The china horses featured were only permitted for inclusion in the Newsletter. The children beg for them all the time but as they are antiques, they can only look wistfully upon them. ‘Sure he can,’ said David. ‘But Dodge was around then. Matt can visit the Cannons!’ said David. ‘Why can’t you come to mine?’ David wanted to know. ‘Okay, then it’s High Chaparral,’ said David. Jacinta turned a funny color and leaned against the car. She gave a resigned sigh and stepped aside as the children came at me like a noisy tumbleweed to wave their goodbye’s. ‘What about one of you being Don Sebastian?’ I suggested. ‘Not when I’m Mano,’ David informed me. His brother shook his head in agreement. ‘So I get to be Mano then?’ asked Kenny hopefully. I took that as my cue to leave in the happy knowledge that the children wouldn’t dream of quarrelling like Mano and his father! The boys were still squabbling as I drove off, with Chrystal in her Victoria pose (I swear she must practice in front of a mirror). High Chaparral in the U.K.
Beginning in October, The High Chaparral will appear on the United Kingdom TCM channel. Check digiguide for more information, or TCMUK.